For fine mechanics, model building, mould construction, toy manufacture, architects, model carpenters and fitters. For cutting wood, non-ferrous metals, plastics, Plexiglas, glass fibre reinforced sheets, foam and many other materials. Stable construction because load bearing parts and plane-milled table are made of die-cast aluminium. The micro-adjustable, precise and stable longitudinal stop provides decisive advantages: Corrections even smaller than 1/10 mm can be made after coarse adjustment using an adjusting screw. 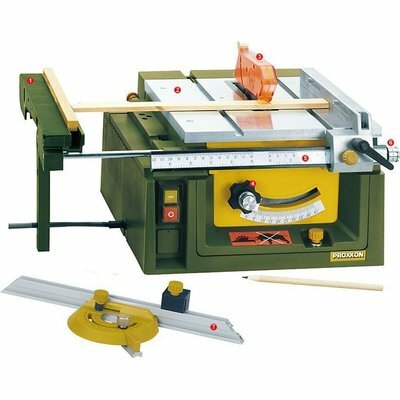 The height adjustable and 45° tiltable saw blade makes it possible to cut double mitres when used together with the angle stop. Low-noise drive using DC special motor with Optibelt toothed belts. Ball-bearinged saw blade shaft. Tungsten tipped saw blade 80 x 1.6 x 10mm (24 T). Additional work piece pusher and non-slotted ABS sawing gap cover for tight tolerances between saw blade and table.